Autumn in Barcelona is undoubtedly one of the best times to visit the Catalan capital. With a warm backdrop of vibrant red, yellow and tangerine shades, Gaudí’s city seems even more beautiful than ever! As the Mediterranean climate cools down, the Barcelona event calendar heats up with exciting festivals, fantastic events and day trips sure to leave a lasting impression. So, why don’t you grab your loved ones, choose from one of the many Barcelona apartments near all of the action, and have yourself an unforgettable autumn getaway! In need of an escape from the hustle and bustle of Barcelona? 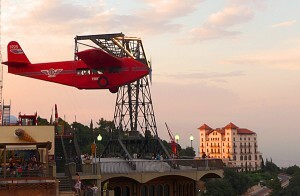 If so, be sure to make your way to the oldest amusement park in Spain, situated on Mount Tibidabo! Leave reality behind as you zip through the clouds on a little red plane, or enjoy breathtaking views of the city from the traditional Ferris wheel at the Tibidabo Adventure Park. The mountain itself is the highest of the Collserola range, reaching a whopping 512m above sea level, and is also home to a planetarium, as well as the beautiful Sagrat Cor Church that can be seen for miles around at night due to its lighting. Take a look at our post on Tibidabo for more information on this magical day out! The tasty gastronomic delights known as tapas are certainly just as large a part of Barcelona as Gaudí designs! These bite-size snacks, which range from spicy nibblings to savory and sweet combinations, are sure to satisfy your palatial desires this autumn in Barcelona. For tapas with a Catalan twist, head to El Xampanyet and enjoy an authentic experience. We suggest the prunes wrapped in bacon, or any of the numerous seafood inspired dishes, fresh from the Mediterranean. Don’t forget the Cava! On November 1st, the day after Halloween, the people of Catalonia celebrate All Saints Day. Otherwise known as La Castanyada, this is a day for remembering loved ones while enjoying some sweet treats. 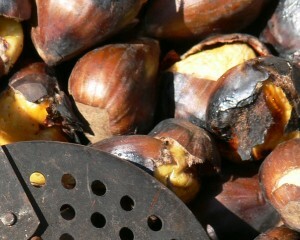 Around this time, vendors on almost every street corner of the city will be selling customary snacks including castanyes (roasted chestnuts) as well as hot sweet potatoes and panellets (little almond cookies with pine nut decorations), all washed down with some sweet muscatel wine. Definitely a memorable culinary experience! Even though the Barcelona autumn calendar is filled with plenty of customary and traditional events, the musical schedule is also one to keep an eye on. With notable artists including Red Hot Chilli Peppers, who will grace the stage at the Palau Sant Jordi on October 1st , and Jesús Guerrero, who is set to perform on October 22nd at the Palau de la Música Catalana, there is sure to be something to suit everyone’s musical tastes this season. And for those who prefer sitting back and losing themselves in the mesmerizing sounds of jazz, you are in luck! The 48th International Jazz Festival in Barcelona runs from the end of October until the end of November, ensuring that you have plenty of time to catch more than one show. Acts from all corners of the globe will take to the stage at venues across Barcelona, including the Palau de la Música and the Harlem Jazz Club. 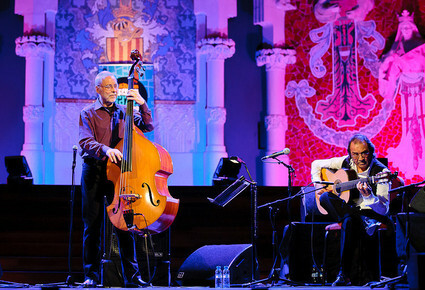 For more information and a full schedule, check out the Barcelona Jazz Festival Official Website. With plenty on offer to suit every visitor, Barcelona is the ideal destination for an autumn break. Enjoy the Catalan customary treats as you stroll along the intimate alleyways of the Gothic Quarter, or lose yourself in one of the fascinating exhibits in El Raval. 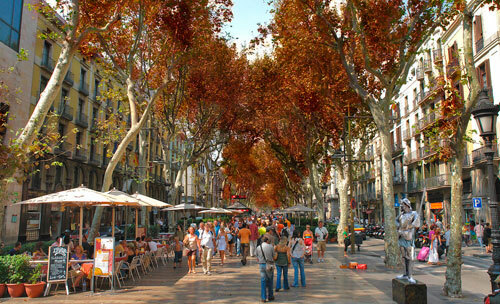 For an all-round experience in Barcelona this autumn, we recommend staying in the Ciutat Vella district of the city. Choosing an apartment in the historical Gothic Quarter for your autumn getaway is ideal as the intricate labyrinthine streets, beautiful plazas and amazing Gothic architecture of this beautiful Barcelona ‘barrio’ are best enjoyed against a colourful autumn backdrop. The neighbourhood, also home to the Barcelona Cathedral, is situated only steps away from the famous Las Ramblas, ensuring that you and your loved ones can soak up all that Barcelona has to offer! A central location, as well as easy access to public transportation makes renting a Ramblas apartment in Barcelona near the Gothic Quarter the perfect choice this autumn! This entry was posted in Activities, Events, Places and tagged barcelona activities, Barcelona activities for children, barcelona apartments, Barcelona culture, barcelona day trips, barcelona events, Barcelona food, barcelona music, barcelona tourist guide, mount tibidabo barcelona, tourism in barcelona, travelling around barcelona, visiting barcelona. Bookmark the permalink.